Many of us want to grow as disciples. And we want to help others do the same. But we’re not exactly sure what to do. How do we grow as disciples and help others along the way? A new conference seeks to help people understand discipleship and learn how to build a culture of discipleship in their congregations. 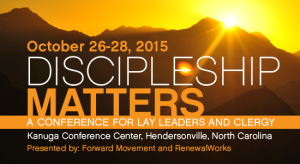 Sponsors Forward Movement and RenewalWorks invite all to participate in the conference, Discipleship Matters: Building A Culture of Discipleship in Our Churches, at the Kanuga Conference Center on October 26-28, 2015. Attendees will explore critical questions for the future of the church such as: How do we build cultures of discipleship? What actually works? And what doesn’t work? Download a schedule of the conference here. Two nationally known leaders will serve as keynote presenters. The Rev. Carol Anderson, former rector of All Saints, Beverly Hills, and the Rev. Dr. Dwight Zscheile, author of People of the Way and The Agile Church, will guide attendees through both teaching and conversation about practical ways to deepen discipleship in one’s own life and in the lives of congregation members. Offering great experience in parishes, and a focus on disciples making disciples, the Rev. Carol Anderson will offer insightful reflection for all attendees. 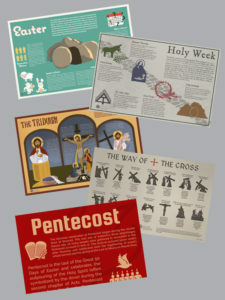 “Discipleship formation needs to be an intentional, thoughtful priority in the life of a parish so that followers of Jesus are equipped to serve him in their daily lives. We hope to encourage and help those who attend to find ways to do that,” Anderson says. 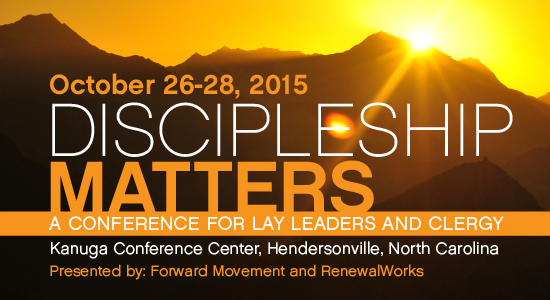 For more information on the Discipleship Matters conference, visit www.renewalworks.org/events. For media inquiries, contact the Rev. Jay Sidebotham, director of RenewalWorks (jsidebotham@renewalworks.org) or Ms. Samantha Franklin (sfranklin@renewalworks.org).